More millennials and centennials are journeying to Pensacola, packing with them an appetite for exploration and adventure. And, with vacation priorities shifting, so, too, have Visit Pensacola’s marketing efforts. “We like to call ourselves storytellers,” said Steve Hayes, president of Visit Pensacola. Experiences, it turns out, are abundant in Pensacola, where history nuts can tour forts Pickens and Barrancas, or walk the Maritime Heritage Trail. Ecotourists may opt for a more challenging hike through Perdido Key, or survey waters from the Pensacola Beach Gulf Pier. In 2018, when millennials comprised the majority of Escambia County visitors, a perception study conducted by Visit Pensacola discovered a strong dislike for pigeonholing. Majority Opinion Research revealed that, while 76 percent of visitors spent time at the beach, its popularity decreased by 15 percent over the last five years. Shopping proved to be the second most popular activity, followed by museums and fine dining venues. While there’s certainly no shortage of beachgoers, it’s evident that altered perceptions of Pensacola correlate with 33 percent growth in visitation since 2013. By doing more storytelling, Hayes is confident that he will lead people to discover the full range of vacation activities that Pensacola offers, and tourism will reach new heights. Who better to endorse the community than those who call it home? “Our local focus groups have really shown us that we’ve got people living here who think Pensacola is the greatest thing since sliced bread,” Hayes said. Visit Pensacola will institute a frontline ambassador training program in 2019, ensuring that its employees are equipped with the best possible tools for making recommendations. “It’s that kind of service that’s going to maintain a high level of satisfaction and rate of return,” Hayes said. 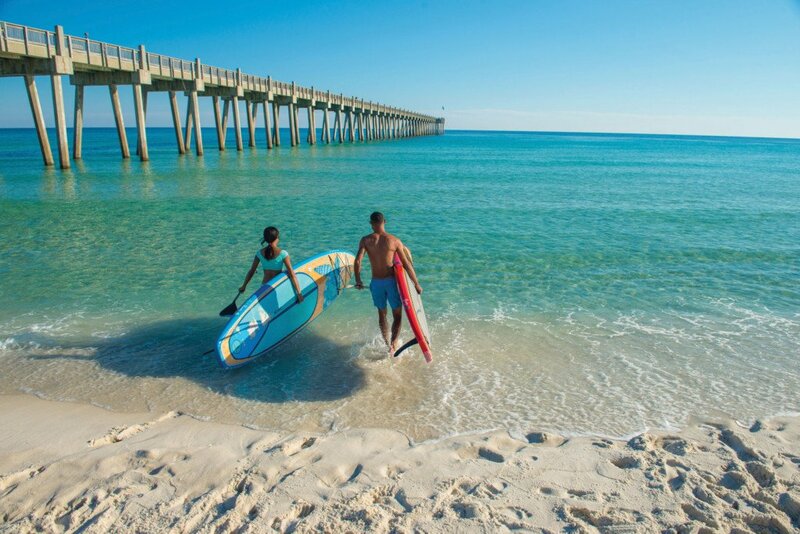 Of the 2.6 million people who visited Escambia County in 2017, 99 percent said they would recommend Pensacola as a vacation destination to others, according to Majority Opinion Research; 94 percent said they would return, and 82 percent aspire to do so within the next year. Many will get there by air. Based on 2017 data, Escambia County visitor spending surpassed $800 million, an increase of 34 percent from three years earlier. More than half of visitor spending is directly attributable to marketing. While Visit Pensacola will devote around $3 million to promotion this year, it will also use a grant from Visit Florida for air service development. New, nonstop flights provided by United, Frontier and Southwest Airlines have resulted in Chicago and Boston emerging as top feeder markets. In 2019, United Airlines will feature a Saturday service flight from Denver during spring break. Nonstop service to New York City is also in the works. The average length of stay has dipped 6 percent since 2013. Visit Pensacola hopes to increase the current average length of stay of 6.3 nights by creating buzz around long-weekend getaways and weeklong vacation itineraries. Based on 2018 data, visiting parties spent an average of $234 per day. If each party extended its stay by a single night, total annual visitor spending would jump by $184.5 million. Tourism provides Escambia County with more than 24,000 Escambia County jobs or about 18 percent of the working population.